Steven Gerrard will not be returning to play for Liverpool, says Reds boss Jurgen Klopp. 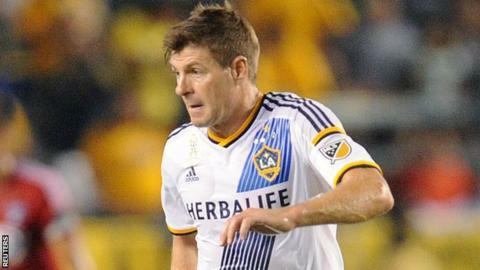 LA Galaxy's Major League Soccer season is over and they expect former Liverpool captain Gerrard, 35, back for pre-season training in January. "If he's in Liverpool and wants to train ahead of next season in LA that's absolutely no problem. Nothing else," said Klopp. "He didn't ask [about playing] so I don't have to think about it." The offer to train at Melwood came from Klopp after Gerrard contacted the German to wish him luck following his appointment as Reds manager at the start of October. There was no discussion about adding to his 710 Liverpool appearances though. Gerrard left Liverpool at the end of the last Premier League season and scored two goals in 14 appearances for the American side after joining them midway through their 2015 campaign. LA Galaxy, who also said there was "no truth" in reports suggesting Gerrard could play for Liverpool, face Mexican side Santos Laguna in the quarter-finals of the Concacaf Champions League in February. Gerrard has suggested he may retire in 2016, saying: "It could be my last season as a footballer. I certainly don't want to feel like I'm feeling right now come next year." Former Liverpool defender and BBC pundit Mark Lawrenson believes the situation has been blown out of proportion. "It is something that was mentioned when he joined LA Galaxy and I said at the time was a really good idea," Lawrenson told BBC Sport. "The manager has changed [from Brendan Rodgers to Klopp] but the general principle hasn't. "If he wants to keep ticking over wouldn't it make more sense to do it at a club he knows, that he has been captain of, rather than Everton or Manchester United or someone else? And why wouldn't Jurgen Klopp want him to come down to the club. "I just think people are jumping the gun and suddenly saying he is going to play and be captain again. It's rubbish really. They are not even off first base. "We are talking about a few training sessions. If something comes of it, that is absolutely fine, if it doesn't that is absolutely fine as well."